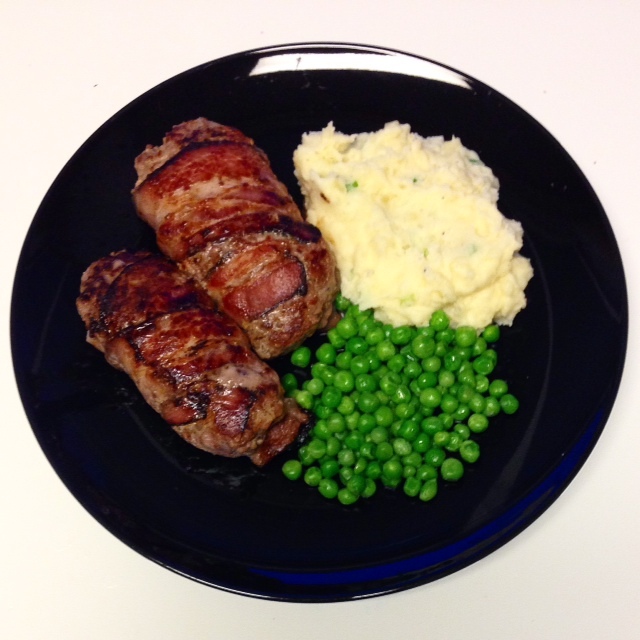 Bacon is Better: Bacon-wrapped Mini Meatloafs with Mashed Potatoes and Peas – Pao Says, "Open Wide!" We had a few strips of Ryan’s favorite bacon left over, so my mission was to incorporate them into dinner. My mom makes an absolutely amazing meatloaf, but its very involved and calls for a lot of ingredients that I just didn’t have. So I decided to make a mini, simpler version with the ground beef I had in my freezer. And what goes better with meat loaf than creamy, buttery mashed potatoes? (answer: nothing). So I made my favorite combo of mashed potatoes and peas. A word of advice: when making peas, use the frozen ones! they always come out crisper and brighter than canned ones! Mix all of the ingredients (except the bacon) together in a large bowl until well blended. I set these aside and let them assimilate for a bit. In a hot skillet (med-hi heat) , I placed all 4 of these and cooked them for about 4 minutes on the first side and 3-4 on the second side. 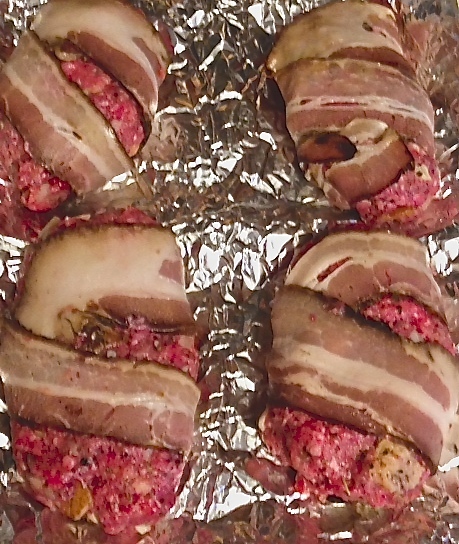 Just monitor these- the cooking time will differ depending on their size. While they cooked, I strained my mashed potatoes and put them together. As far as putting the meal together goes, I started my cut-up potatoes in salted water to boil before I started unifying my meatloaf ingredients. This way, while the mini meat loafs were cooking away, I could put together my mashed potatoes. After straining the potatoes (once I made sure they were tender and ready to mash), I put them in a bowl with some butter (about 1/2 tbsp butter per serving). I also take the opportunity to sprinkle some parmesan cheese over the potatoes at this point, while they’re hot, so the parm melts. I added some milk (add it a tbsp or two at a time while you’re mashing until you get the consistency you want), and a dash of pepper. Once the potatoes are coming together, I also like to add some chopped scallions or chives. Once I’m done mashing, its time to flip my meat loafs! The peas were super easy- steam them in a 1/4 inch of water in a pot with a little salt. Once they are ready (about 4 minutes), drain the water out and add a little butter. Butter makes everything better. Like bacon. Bacon also makes everything better.